When you are doing your accounting in tally, taking backup of tally data is very much essential in case anything happens to your computer. After you have taken your tally data backup, you should also know how you can restore the tally data backup and this is where most people miss out. What is the point of taking a backup of tally data when you don’t know how to restore it. It is as good as not taking any backup of tally data. 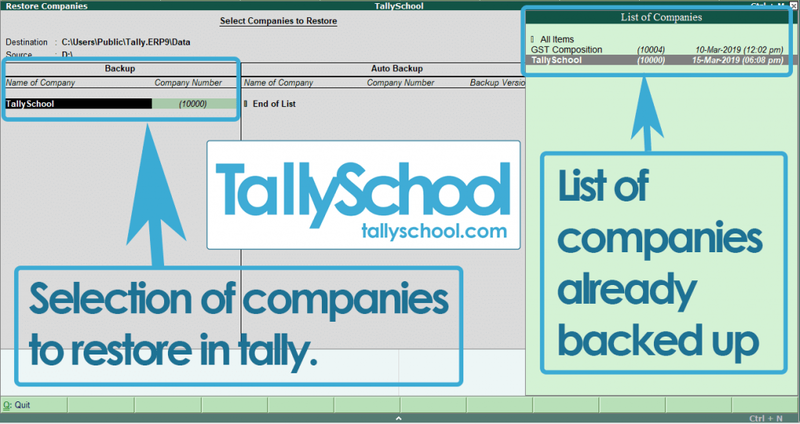 In this post, I will show you how you can take tally backup and restore tally data in a very simple and easy way. In fact, more than 1 ways. Whenever you create a company in tally, a separate folder is created for that company. That folder has several files in it related to that company. All the folders of these companies are stored in another folder called Data. Each company in tally also has a specific 6 digit code which begins from 10000 for the first company you create in tally. It is called company number in tally. After that, for next company, it will be 10001, 10002 and so on. The folders that are saved in Data folder are named after the company codes. 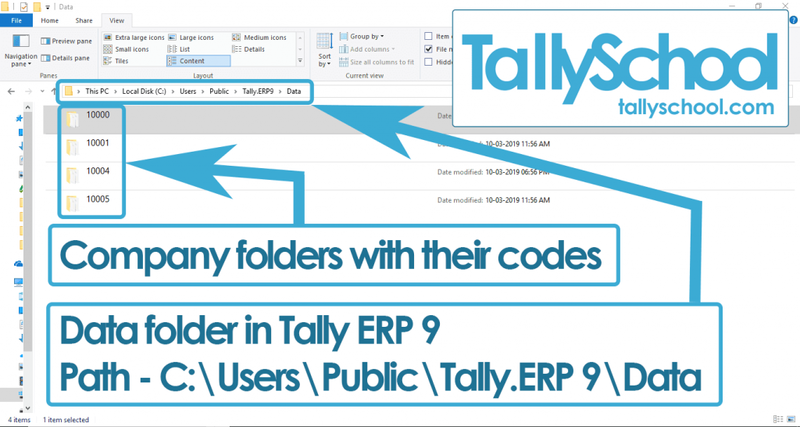 Everything you do in tally is stored in their respective company folders with codes and all the company folders are stored in a single folder called Data. Look at the image below to see how the Data folder is saved in your computer. Today, we are going to look at how you can backup all of your tally data and also restore it step by step. I am also going to show you a simple and a free method to automatically backup your tally data 24/7. Let’s start with the process of tally data backup. 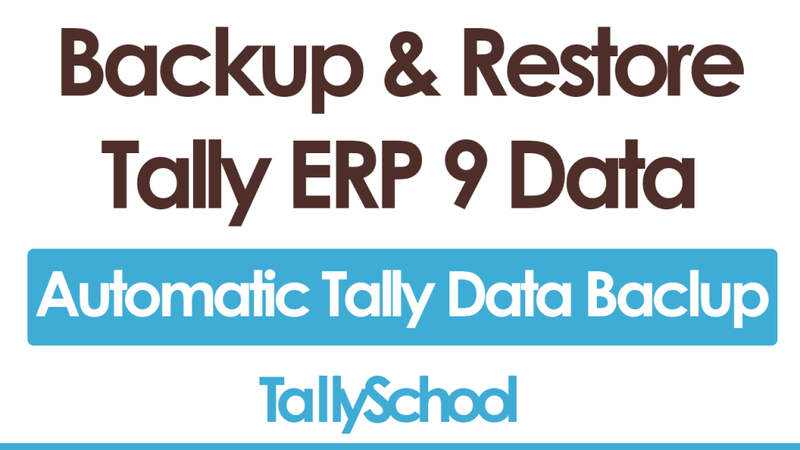 There is a very easy and simple process to create a backup of your tally data in Tally ERP 9. Let me show it to you step by step. From Gateway of Tally, go to Company Info. from the right hand side green bar or just press ALT + F3 which is one of the 380+ tally shortcut keys. Now, you will find the option of Backup in the company info. Menu. Select that. Press Enter on Source and Destination options and you will now see a list of all the companies in your tally on the right hand side of the screen. Select the companies that you want to backup in tally. You call also select the option – All Items to select all the companies at once. After you have selected the companies for backup, you will see the list on the left hand side of the screen that are ready to be backed up. 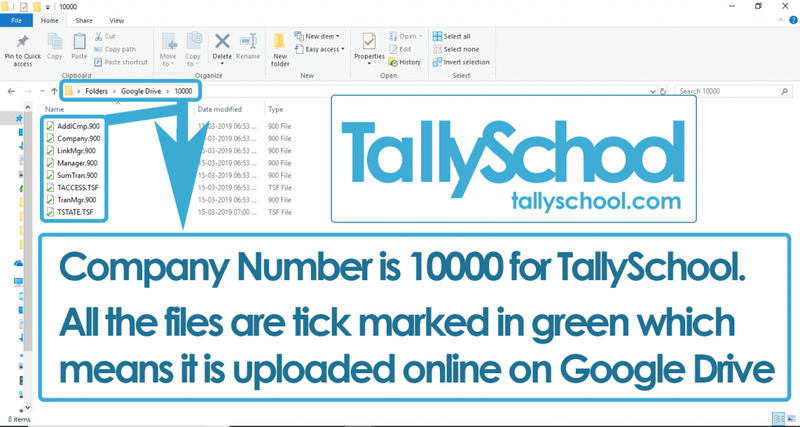 For this example, I will be selecting TallySchool – 10000 for backup in tally. Before you start the backup, you have to take care of the destination folder – where the backup files will be located on your computer or laptop. Select that location appropriately. I recommend that you put the destination that is different from your source location. For example, generally, your main tally files – source, will be in C drive. So, select destination location to some other drive. It can be D drive or E drive. Now, press Enter a few times and accept the option to take the tally data backup. Congratulations! You have successfully taken the backup of your tally data. Now, we will see how you can restore the tally data that we have just backed up. Restoring data backup in tally is very easy if you have taken the tally data backup correctly as we have seen above. Here is a step by step process to restore your tally backup files. From Gateway of Tally, go to Company Info. option. Under the option of Backup, there is an option to restore the data in tally. Select the option of restore. As soon as you go into that option, you will see list of companies that you have backup with the destination and source of the backup. If the destination and the source locations of the backup are correct, you will see all the companies that you have backed up. In our case it is TallySchool. Select the company or companies that you want to restore and press Enter. If the same company number exists, Tally will ask you to overwrite the information. Press Enter to overwrite and your data will be restored in tally. Congratulations! You have successfully restored tally data backup in Tally ERP 9. Now, we will look at a completely different way to take automatic data backup in tally. Till now, we have seen data backup and restore options that were inside tally. Now, I am going to show you a completely different way that I had discovered for automatic data backup in tally. We have discussed about the Data folder in tally where are all the folders of the companies are stored. That is what we are going to use it right now. When we install tally, we can set the location of the data folder where all of our company data is stored. Now, what we will do is, we will set the location of the data folder in a way where it is automatically backed up in cloud. I am talking about Google Drive or Onedrive or Dropbox or any of the cloud services which gives the options to download it and backup and sync our data as a folder. Let me show you what you have to do and how exactly it works in Google Drive using backup and sync. With backup and sync, what Google Drive will do is sync your files and folders in your computer on Google Drive. We will change the path of our Data folder in Tally to the Google Drive folder which synchronizes on the cloud. And, Google Drive is free to use up to 15GB. So, you can virtually use it for free. Let me show you how you can use the above method of automatically backing up your tally data with the help of Google Drive. Firstly, download Google Drive from clicking this link. After you have downloaded the setup file, double click on it and install it. Now, a window will open up and it will ask you to sign in using your Google ID and password. You can now find a folder named Google Drive on your desktop. You have to now just do one thing. Change the path of the Data folder to the path of Google Drive. To change the path of your Data folder, you need to go to Configure – F12 and select Data Configuration. Now, change the location in the option of Data Files to the location of your Google Drive folder in your computer. One last step you need to do is to restore the companies that you have backed up as per the method we have seen in the beginning of this video. Now, what will happen is all your companies and all your data will be stored in the Google Drive folder. And, Google Drive folder is automatically on sync in the cloud online. In this way, all your tally data is in sync with the Google Drive and is automatically backed up 24/7. You can also change the path to the data folder while installing tally on your computer. Important Note: You can also change the path of the folder to which you do backup in tally manually to Google Drive. That way, your manual backup is also saved online. Congratulations! You have successfully learned how to automatically backup your data in tally online 24/7. Now, we will see, how you can send a tally data backup to anyone via email or pen drive or in any other way. We have just learned how you can backup your tally data online on Google Drive. You can easily share a link to that folder to anyone via email. So, you can send a backup of your tally files through email to anyone by this method. If you have backed up your data using the manually from inside the tally, you can create a zip file of that folder and send it to anyone using email or pen drive or any external device. One more way to send backup is using the Data folder of tally itself. Create a zip file of the Data folder and send it to anyone using email or pen drive. These were the 3 ways in which you can send the tally backup data to anyone using email or pen drive or any external device. In this post, we have seen how you can take backup in tally and restore it using the controls and options given in tally. We also saw how you can take automatic tally data backups online using Google Drive. And, finally, you learnt, how you can send your tally backups to anyone using email or pen drive in 3 different ways. Taking backup of your data in tally is very much necessary because it is after all accounting data of your business. If something happens, you will always have a tally backup. After going through this post, if you have still any doubts or suggestions or questions, please comment down below.